I know I'm late to the party on this one, but I had to review this game. 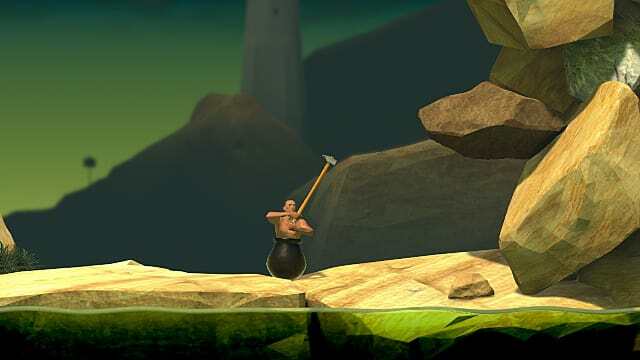 Getting Over It with Bennett Foddy is the most recent game from -- who else -- Bennett Foddy, an on-again-off-again game designer most famously known as the man behind QWOP. 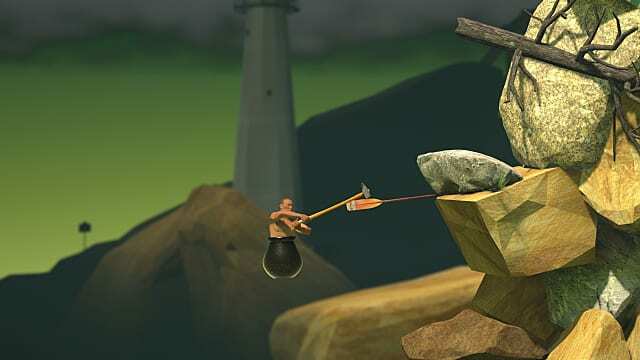 Similarly to that classic pass-around title, Getting Over It can most easily be defined as a rage game built around an intentionally complicated and frustrating control scheme. If you've been hanging around the gaming scene on YouTube and Twitch lately, odds are you've seen this game at least a little. It exploded in popularity as a game that people love to watch people throw their controllers and scream over, and laugh over the difficulty and absurdity of when they play it themselves. But the question I'm here to ask is this: How good of a game is it really? This sort of thing tends to happen with rage games that explode online and live to be watched -- people don't review them as often as other games --maybe because most reviewers think that these games speak for themselves and that the community has already made up its mind. Well, I for one have made up my mind, and it's dead set on analyzing this cauldron of rage and mocking philosophy. I accept your challenge, Bennett Foddy, and I don't take kindly to being made fun of. Let's try and get over it together. Let's go over the basics for all those uninitiated. 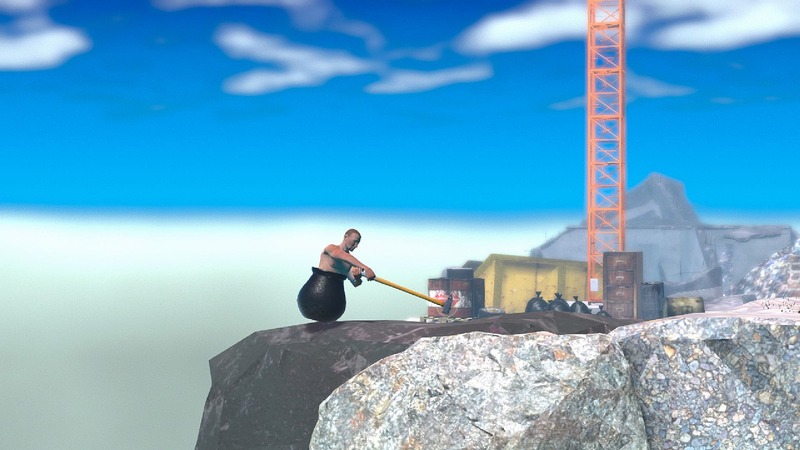 In Getting Over It you play as Diogenes -- a reference to Greek mythology -- who is a man sitting in a cauldron attempting to climb a very tall and convoluted mountain using nothing but a sledgehammer. 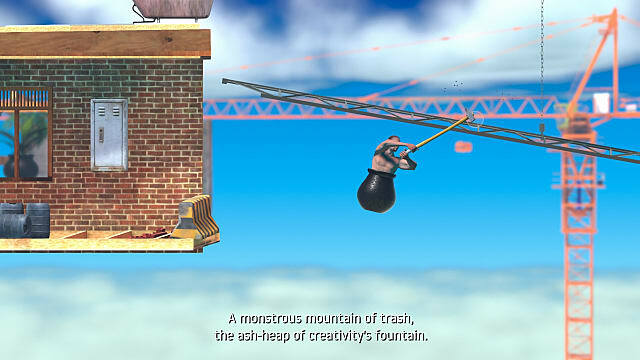 While you play, the game's developer, Bennett Foddy, comments over the gameplay, explaining why he decided to make this game the way he did, what inspired it, and his general feelings about progression in games as well as challenges in both entertainment and life. What you see is what you get in this case. After you play the game for about a minute and start to understand the controls, and struggle to pass a single obstacle that would be simple in any other game, you've basically seen it all. Just multiply the effect by a dozen hours or more, and imagine the whole thing getting harder and harder to a frankly ludicrous degree, often being purposely obtuse and unfair, sprinkled with some vaguely philosophical quotes, and you've got the whole experience right there. There are some positives to the experience, don't get me wrong. While in most places the visuals are kind of drab and basic, the random mishmash nature with which some of these pre-made assets are smashed together has a sort of quirky charm. Some of the quotes that are given are insightful, Bennett Foddy does have some nice poetic language and a few little tidbits about difficulty that are intriguing, and I'll admit that I did have some fun for the first few hours, even when I was very frustrated. However, what positives the game has weren't nearly enough to nullify the fact that I was extremely frustrated by a game that is extremely basic and wildly hard and often unfair. I decided that I didn't want to play anymore after getting barely any further after nearly six hours of playtime, and I gave up. I'm going to be clear here: I did not beat this game. Maybe I can beat it, but after hours and hours of playing and barely getting anywhere, I decided that is was too annoying and often repetitive and boring for me to want to. I just stopped caring. I understand the overall message it's going for -- the idea that there are great challenges in life that will wear and tear us down, and that we only truly fail and lose when we stop trying and give into despair, but honestly, I found this approach pretentious at times. The mechanics of every mistake being permanent and auto-saved constantly and there being no checkpoints to act as a safety net are definitely effective in conveying the game's themes of dedication and struggling through adversity, but from a gameplay perspective, it's all just so annoying. Whatever the truth or value in the game's message and the way it chooses to approach it, in practice, it plays like Hell on Earth. The controls are so sensitive, and the pace so often fluctuates between slow and careful planning in tighter spots and frantic high-speed panicking in moments of stress, that you are absolutely guaranteed to get upset with this game at some point. I'm also fairly certain that while the physics are at least fairly consistent, they are weighed against you. You will constantly either get thrown off of a ledge because of a tiny little mistake and lose 20 minutes of progress, or not be able to move reliably at all if you and your hammer are wedged in an uncomfortable spot. On top of all that, there's no music to speak of, and once you run out of quotes and commentary for the section you're on if you're very bad, then you're just left in silence with nothing to do but get frustrated and stare at the often very basic visuals. After not too long, the joke will wear thin, and all you're left with is a very basic and intentionally frustrating game with nothing to do in it but try and fail over and over to do very basic tasks. This spot right below is immediately after the first major section of the game. It too me over four hours to get here. Four hours of playing the same three minutes over and over. I knew what anger was before I played this game, but it very kindly reminded what it truly means. It's not a horrible game really, but it's just so frustrating and mechanically basic that I feel you're well within your right to get bored or angry with it after an hour and put it down to play something else. Bennett admits openly that this game is horribly, bitterly difficult and frustrating by design, and that he feels some people's tastes are suited to this sort of challenge. While I feel he's right, I also feel that for me, and a lot of other people, that doesn't make the game any better or more fun as an experience. It's been so difficult to write about Getting Over It because I think this may be the most subjective gaming experience I've ever encountered. There just doesn't seem to be a completely clear consensus on it. While I am a firm believer in the idea that there are certain aspects of most games that can be viewed objectively, and that there are contributors to a game's quality on both a technical and artistic level that can be logically qualified, I also firmly believe that anyone is allowed to enjoy any game they want. While I've already got my own issues with this game, and there are plenty of technical faults I could point to, I also understand that a lot of people enjoy this kind of game. I always try to take into consideration the fact that there's bound to be somebody who likes even the games I hate the most and vice versa, but with Getting Over It, it was just too hard to ignore the divided opinions on it. I've seen equal amounts of people both online and in real life that either hate the game because it's condescending and obnoxiously and purposely unfair, or who think it's hilarious for those same reasons and have a great time laughing at its absurdity. This is why I'm scoring the game like I am. For whatever its faults -- intentional or otherwise -- it's a game that seems to either leave you ecstatic or enraged. If you want to play a different 2D indie game that's very difficult, but actually fairly designed, and also based around scaling a mountain analogous to overcoming a massive personal conflict -- then get Celeste. Getting Over It is not what you're looking for if you want something hard but fair. It's the kind of game you either play to get angry or to have a laugh, sometimes in the span of the same 20 minutes. Also, I'd like to take a moment to briefly address Bennett Foddy himself. Bennett, I don't know you, and I will probably never meet you in real life. I have nothing against you personally, and I'm sure you're a nice guy, but since you and your game have taken to poking fun at me and its other players, I'm sure you won't be too upset if we trade blows for a minute. Your game left me too frustrated to continue, and both it and you have beaten me for today, and you will always have that over me. However, I am also content with the knowledge that while that is true, I don't like your game all that much anyway, and I'm off to spend my time on games I find much better, and I will always have that over you. I may not have been able to get over it, but I am totally over it. I can only recommend this game if you think the idea is funny enough to carry itself or if you genuinely like the idea of a monumental, often unfair challenge. Otherwise, I would stay away from this one. 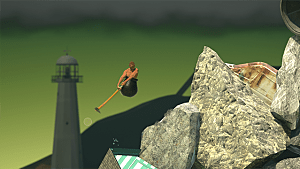 Getting Over It may be unfair and frustrating by design, but even acknowledging that, it doesn't make it any less annoying or any more satisfying.